These WGs sought to enhance capacities for medicinal chemistry research in LMICs and at the same time to encourage LMIC scientists to participate in practical programmes for drug development. The WG in Medicinal Chemistry was wound up in 2015, but one of its important projects was to develop a distance education programme in medicinal chemistry, let by Prof. Lester Mitscher and Prof. Tom Prisinzano at the University of Kansas. This activity remains active as project within IOCD's Distance Education programme - for details of this, click here. Medicinal chemistry is a multidisciplinary, chemistry-based discipline that involves aspects of biological, medical, and pharmaceutical sciences. It is concerned with the invention, discovery, design, identification and preparation of biologically active compounds, the study of their metabolism, the interpretation of their modes of action at the molecular level and the construction of structure-activity relationships. Since the 19th century, medicinal chemistry has helped transform human health, providing drugs for the prevention and treatment of many life-threatening infections and metabolic disorders and helping alleviate pain and suffering. New drugs are constantly needed, whether to provide better treatment of known illnesses, combat the constantly evolving resistance mechanisms of pathogenic organisms, or provide an armoury of defences against newly emerging infectious diseases that constantly appear. At its inception, IOCD established WGs in Male Fertility Regulation and Tropical Diseases — at the time, both being very neglected areas that were of specific concern to LMICs. Each WG assembled a team of scientists from across the world to engage in the design, synthesis and testing of potential new medicinal agents. Many chemists in LMICs participated in funded synthesis projects and were assisted with advice, supplies and analytical services. The WGs were valued by international partners (including the two WHO Special Programmes for research in fertility regulation and tropical diseases; UNFPA, Walter Reed Army Institute; and CONRAD programme) and helped raise awareness of these neglected areas while providing LMIC synthesis groups opportunities to undertake medicinal chemistry. The Tropical Diseases WG continued to operate up to 2010, shifting its approach from synthesis work to participation in meetings for networking and upgrading knowledge and skills. The WG benefitted from an association with the European Cooperation in Science and Technology programme on Drug Discovery and Development for Parasitic Diseases (COST B32) and IOCD provided a number of travel grants for LMIC scientists to participate in COST meetings, e.g. in 2006 and 2007. IOCD has organized international symposia and workshops on medicinal chemistry to facilitate professional updating, training and networking, including meetings in Mexico, France, USA, UK. Providing travel grants to LMIC scientists to let them participate in special workshops and training courses around the world. The first recipient of such a grant was Dr Berhanu Abegaz, then in the Department of Chemistry at the University of Botswana. He used the award to attend the VIII Winter Conference on Medicinal & Bioorganic Chemistry in Steamboat Spring, Colorado (USA) in January 2007. Click here to read his abstract. Dr Abegaz has subsequently gone on to become the Executive Director of the African Academy of Sciences. 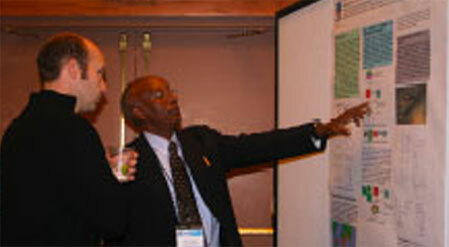 IOCD Travel Award recipient Dr Berhanu Abegaz (on the right) explains his research on antimalarials at the 2007 Winter Conference on Medicinal & Bioorganic Chemistry. Organizing a Distance Learning Course on Medicinal Chemistry to help scientists in LMICs gain knowledge about the latest methods to advance their research. This course, available online at no charge (see details here), consists of PowerPoint slides illustrating fundamental concepts in medicinal chemistry and how they may be applied to the solution of problems involved in designing potential therapeutic agents and solving problems that arise in their progression to clinically useful materials. It is divided into four segments: Introduction, Pharmacodynamics, Pharmacokinetics, and Operational Stratagems. Progress through the course is aided by quizzes at short intervals in each of these sections. The course was designed by Dr. Lester Mitscher and is based on presentations he has made in the U.S. and abroad over a number of years. The course content will be updated annually based on feedback from users and the IOCD Executive Board. The Division of Continuing Education of the College of Pharmacy, University of Kansas, adapted the material to a distance learning model using funding from IOCD.